We’ve been giving away a lot of great jewelry lately so why stop now?!? 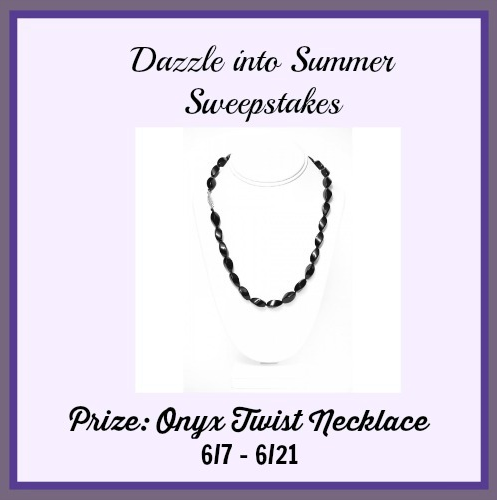 Enter to win our dazzling into summer sweepstakes to win an Onyx Twist Necklace by Medu Jewelry. It retails at $625! Giveaway is organized by Budget Earth and sponsored by Medu Jewelry. Enter to win this gorgeous gemstone necklace below and good luck everyone! Do you love gemstone jewelry but not the price tag? What would you say if we told you we know the perfect place to get high quality jewelry at unbelievable prices? If so, we are excited to tell you about one of our new favorite jewelry stores – Medu Jewelry. What makes this jewelry store different from your everyday jewelry store is that they offer high quality gemstone jewelry at amazing prices, by cutting out the middle man. Each of the gemstones used to make their jewelry comes directly from the mine, and the pieces manufactured by Medu Jewelry, giving them full control over the making of their jewelry. At their website, you can necklaces, bracelets, and even rings in your favorite gemstone. To learn more about their jewerly and the company, make sure to check out Budget Earth’s Medu Jewelry Onyx Twist Necklace review here. Would you love the chance to own this gorgeous onyx necklace? Budget Earth and some of our favorite bloggers are excited to be working with Medu Jewelry on this awesome giveaway! One lucky reader will have the opportunity to win a Onyx Twist Necklace (suggest retail $625+ in the United States). To enter, make sure to read the rules below and then enter through the Rafflecopter. One lucky reader will win an Onyx Twist Necklace from Medu Jewelry. Sweepstakes ends June 21 at 11:59pm ET.